This file illustration photo shows a man using a laptop at an Internet cafe. 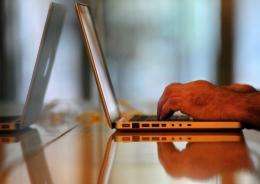 New Zealand said it was considering making cyber-bullying a criminal offence, amid concerns that existing laws offer inadequate protection from online harassment. As a parent I try to protect my kid from this type of bullying by using a monitoring tool, Qustodio.